Narrow Street iphone x case by Basant Soni. Protect your iPhone X with an impact-resistant, slim-profile, hard-shell case. The image is printed directly onto the case and wrapped around the edges for a beautiful presentation. Simply snap the case onto your iPhone X for instant protection and direct access to all of the phone's features! Thanks Miro for liking the concept of "Eco Friendly Art"
Mastrfuly done with organic materials.Great perspective,depth and composition!Completely wonderful work Basant Soni ! Excellent composition, texture and design! Nice work with Organic materials Basant. Great job. very nice urban scene; wonderful. 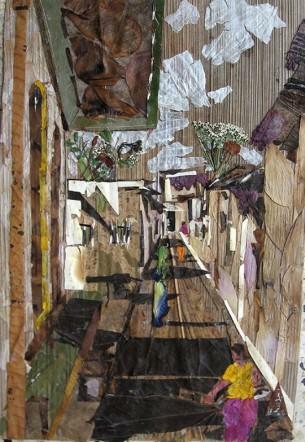 The 'Organic art' shows the light & shade in narrow street,situated in small city. Our mother earth ingredients viz.dried flowers,leaves..twigs,petals,etc. were used to render colorful-effect on the canvas of palm tree. .